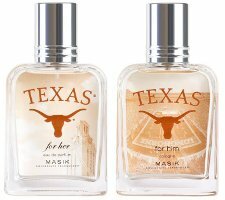 Masik Collegiate Fragrances has added a new fragrance duo for the University of Texas. A signature scent exclusively created to capture the essence of The University of Texas. The Spirited Passion of the Hook ‘em Horns, The Dramatic Beauty of the UT Tower bathed in Burnt Orange and The Immense Devotion to the Longhorns Spirit. Passionate, Triumphant and Strong. University of Texas for Her ~ "A spirited new fragrance created to pay tribute to the University of Texas women opens with a sparkling top note of Bergamot, and Ruby Redcurrant. The heart of the fragrance is an addicitve floral blend of Orange Blossom, Mimosa and Jasmine. Aromatic Patchouli, Creamy Vanilla and Musks round out the background ensuring a long lasting fragrant appeal." University of Texas for Him ~ "Capture the passion of burnt orange-clad fans, as they make the "Hook em Horns" gesture, with a new University of Texas men’s fragrance. The energizing spirit of Pimento Berry and Rosemary blends with masculine strength of Soft Woods and Golden Amber. A unique Aged Bourbon Accord enhances the overall appeal of this fragrant combination." Masik Collegiate Fragrances University of Texas for Her and for Him are available in 50 ml Cologne, $40 each. I live in Texas. Although I went to the University of Houston, I can already tell you that this will sell like hotcakes down here. People aren’t going to really care what it smells like. I think that’s probably true of all of their college scents! There’s another one for Texas A&M, but no U of Houston. Posted right before, and ha, nearly anything would qualify, right? But these were extra-good! If Texas A&M were to have a fragrance (the Aggies…and they have passionate passionate fans, really) there’s only one thing it could smell like…’nough said. You must mean iced pineapple and peach, right?